Nearly two-thirds of Americans (64%) say wealthy people will gain influence in Washington when Trump takes office. Just 8% say they will lose influence, while 27% expect the wealthy will not be affected. In addition, about half of the public thinks whites (51%), men (51%) and conservative Christians (52%) will gain influence. Relatively small shares (no more than 15%) think any of these groups will lose clout in a Trump administration. The national survey by Pew Research Center, conducted Jan. 4-9 among 1,502 adults, finds that majorities think Hispanics (56%), poor people (55%) and gays and lesbians (54%) will lose influence in Washington during Trump’s presidency. And far more say that blacks and women will lose influence than gain influence (48% to 19% for blacks, 46% to 23% for women). Asked about how various institutions and their leaders will fare during Trump’s presidency, majorities say business corporations (74%) and the military (64%) will increase their influence with Trump as president. By contrast, 60% say environmentalists will lose influence, while 54% say the same about union leaders. Views about the impact of Trump’s presidency on Washington lobbyists are mixed: While 36% think they will gain influence under the new administration, about as many (37%) say they will lose; 21% think lobbyists will not be affected. The public’s assessments of the groups that will gain and lose influence in Trump’s presidency are sharply different than before Barack Obama took office eight years ago. In many cases, they mirror views of expected “winners” and “losers” under George W. Bush before he took office in January 2001. But there are some notable exceptions. For example, today just 24% predict that children will gain influence under Trump, while 32% say they will lose influence and 41% say their influence will not be affected. In 2009, 64% expected children to gain influence under Obama and 50% said the same about children during Bush’s presidency in 2001. In January 1993, 62% said children would gain influence in Bill Clinton’s administration. In another change from recent presidents, more Americans say “people like yourself” will lose influence than gain influence in Washington when Trump takes office. 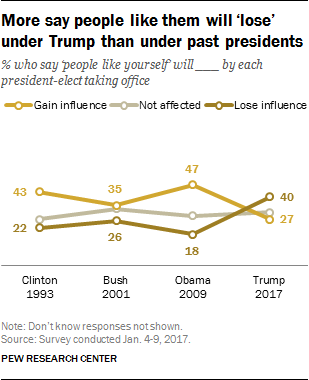 Currently, 40% say people like themselves will lose influence by Trump taking office, while 27% say they will gain and 31% expect not to be affected. Just prior to Obama taking office in 2009, more than twice as many said people like them would gain rather than lose influence (47% vs. 18%) and the margin was nearly as wide before Clinton took office in January 1993 (43% vs. 22%). In early 2001, 35% said people like them would gain influence with Bush in the White House, while 26% thought they would lose influence. As in the past, these views are divided along partisan lines. Among Republicans and Republican-leaning independents, 45% think people like themselves will gain influence by Trump’s taking office, while just 13% say they will lose influence. Four-in-ten think they will not be affected. By contrast, a wide share of Democrats and Democratic leaners think they will lose influence in the Trump era: 65% say this, compared with just 12% who think they will benefit and 21% who say they will not be affected. 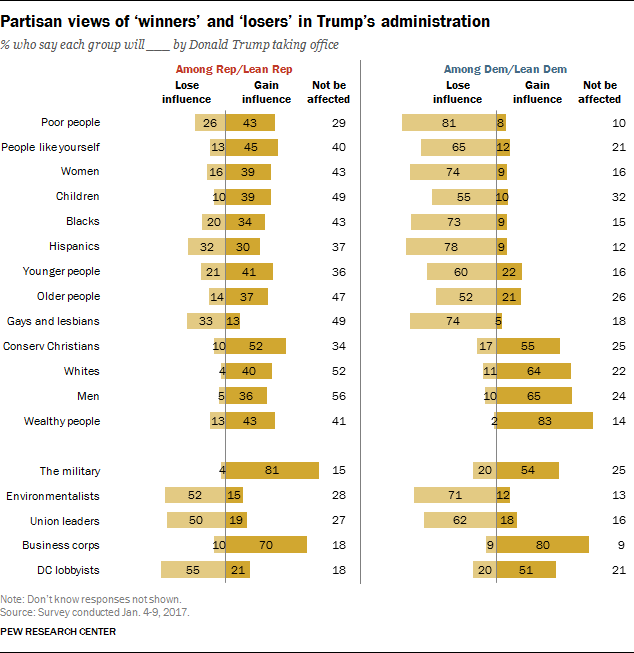 Republicans are much more positive about the influence of people like them under Trump than they were before Obama or Clinton took office. However, fewer Republicans say “people like yourself” will gain influence in Trump’s presidency than said this before Bush took office (45% now, 56% then). And while Democrats are more negative about the influence of people like them than they were prior to the Obama or Clinton administrations, they also are more negative today than before Bush took office. Currently, 65% of Democrats say people like them will lose influence with Trump as president; 44% of Democrats said this about the Bush administration at a comparable point in 2001. 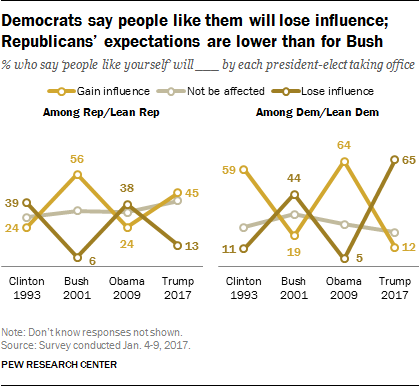 The public’s views about which groups will gain or lose influence in Washington under Trump’s administration are more similar to expectations for Bush’s presidency than either Obama’s or Clinton’s. 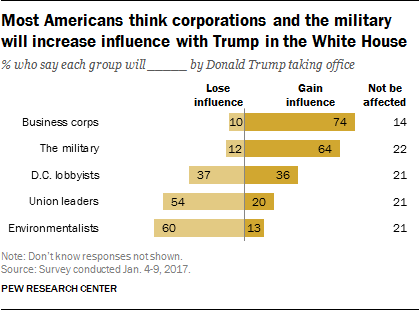 In early 2001, most Americans thought business corporations (66%) and the military (72%) would gain influence under Bush; today, wide majorities say the same about Trump (74% business corporations, 64% the military). And nearly identical shares say conservative Christians (52%) and lobbyists in Washington, D.C. (36%) will gain influence in Trump’s presidency as said that about the Bush administration (51% and 35%, respectively). Far fewer thought conservative Christians and lobbyists would gain under Obama (21% each). As noted, however, smaller shares expect children to gain influence in Trump’s presidency than said that about Obama, Bush or Clinton before they took office. This also is the case in perceptions of how older people will fare. Currently, just 27% think older people will gain influence with Trump as president, while 35% say they will lose influence and 36% say they will not be affected. In January 2001, 46% said older people would gain influence under Bush’s presidency, while 39% said the same about older people under Obama in 2009 and 42% expected older people to gain influence under Clinton in early 1993. In addition, just 19% expect blacks to gain influence in Trump’s presidency, the lowest share saying that about any recent incoming president, including Bush (30%). Republicans and Democrats differ substantially in views of how most of these groups will fare during Trump’s presidency. Sizable majorities of Democrats say a number of groups will lose influence with Trump in the White House: 81% say the influence of the poor will decline; 78% say the same about Hispanics; 74% each say women and gays and lesbians will lose influence; and 73% say this about blacks. 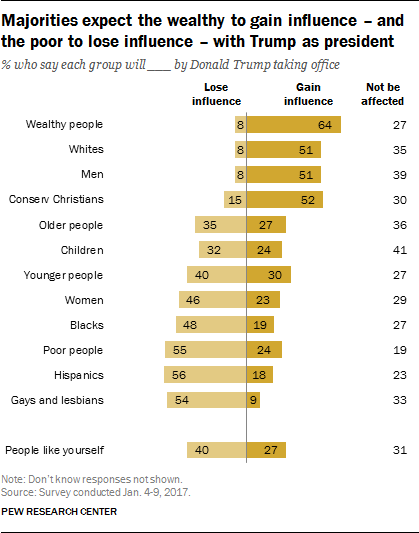 No more than about a third of Republicans say any of these groups will lose influence with Trump in the White House (33% gays and lesbians, 32% Hispanics). 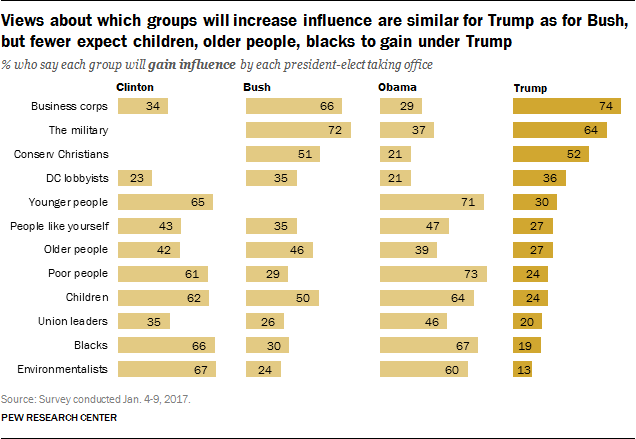 Most Republicans expect that these groups will either gain influence or not be affected by Trump’s presidency. On the other hand, 83% of Democrats expect wealthy people to gain influence in Trump’s presidency, while close to two-thirds say the influence of men (65%) and whites (64%) will grow. By contrast, only about four-in-ten Republicans anticipate that the influence of these groups will increase (43% wealthy people, 40% whites, 36% men). Among the more striking partisan differences are on whether lobbyists in the nation’s capital will gain or lose influence during Trump’s presidency. Among Republicans, 55% expect that the influence of lobbyists in Washington, D.C. will decline, while just 21% say their influence will increase (18% say it will not be affected). Democrats hold nearly the opposite view: 51% expect lobbyists to gain influence and 20% say they will lose influence (21% say their influence will not be affected). Despite these differences, Republicans and Democrats do share similar expectations for some groups: Large majorities in both parties say business corporations will increase their influence with Trump in the White House (80% of Democrats, 70% of Republicans). And about half in both parties expect conservative Christians to gain influence (55% of Democrats, 52% of Republicans).